The best producing winter vegetable garden is one that is well planned. It is important to know your first frost date as well as the time it takes for your chosen vegetables to mature. Extending your growing season is also a great way to enjoy winter vegetables. Check out these tips on how to have a productive winter vegetable garden. There are three important things to consider when planning your winter vegetable garden. The first step in starting the best producing winter vegetable garden for your location is finding out where you can grow vegetables during the winter months. Gardeners in northern climates generally have the most success with the use of cold frames or greenhouses to extend the season. Southern climate gardeners have an ideal climate for planting winter crops. Their gardens often offer more variety than their northern counterparts. Extreme southern gardens can grow summer vegetables, such as tomatoes, in the winter months.You can grow winter vegetables almost anywhere, as long as you are willing to put forth the effort required to give your plants the necessary growing conditions. Often this means planting your vegetables on the south side of a building where they will not only receive more sunlight, but also some protection from winter winds. 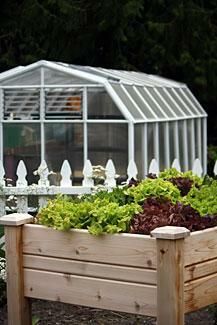 You can also considering growing vegetables in containers for winter consumption. Timing is critical when you are planning your winter vegetable garden. It is important to know the first average frost date for your location. Usually you can find this out by looking at a map of growing zones. Find where you live on the map, and then see what zone it places you in. The chart that goes with the map will usually tell you the first and last frost dates for your zone. You can also call your local Extension Service office and ask them. Once you know when to expect your first hard frost, you can then determine how long it takes for your chosen vegetables to mature. Typically, you will find this information on the back of your seed packet. If you are purchasing seedlings, check for a tag that tells you the days to maturity for that variety of plant. If the vegetable you have chosen says that it takes 90 days to maturity, simply calculate the date that would be 90 days before the first hard frost in your location. This can be extended a bit if you live in a warmer microclimate or if you use season extenders to protect your vegetable garden. There are certain vegetables that are best suited to a winter vegetable garden. 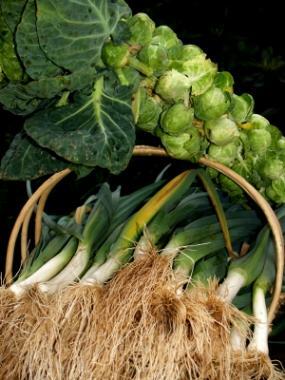 Some of these vegetables, like parsnips and Brussels sprouts, actually have a better flavor if allowed to be touched by a light frost. Root vegetables can be harvested very late into the winter if they are protected by heavy mulch. You can extend your growing season by using a couple simple tools of the trade. 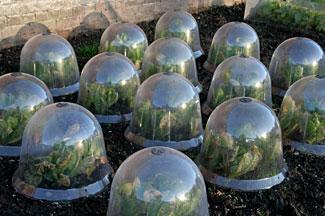 Cloches are a great example. These portable, mini-greenhouses fit over an individual plant to keep it warm and protect it from the harsh elements. Keep in mind that on sunny days you will need to open it up and allow some of the heat to escape. Easily create one by making an arch with some half-inch PVC pipe that is long enough to reach from one side of your garden spot to the other. For example, a ten-foot length arched over a small five-foot garden patch would be about three feet tall. Depending on the length of the area you intend to cover, you will at least need one for each end and possible a few in the middle. Now just cover with some clear plastic and secure it to the PVC. This completes your mini-greenhouse. Raised beds also can help to extend your growing season. The soil in a raised bed is warmer, especially if you use old tires to build your raised bed. The black tires will absorb the sun's heat, allowing vegetables to survive longer in the winter as well as being a great way to start early in the spring. It is important to note, some do not like to use tires to plant vegetable out of concern for chemicals seeping into the soil. Some studies say the amount is negligible. You will need to do the research and decide for yourself if this is a good option for you. Learning how to successfully grow winter vegetables allows you to extend the growing season so you can enjoy fresh produce almost year round. Being able to round out meals during the winter months with some garden fresh vegetables makes those dreary days seem a little brighter and adds healthy nutrients to boost the immune system. Sometimes it's tempting to become more sedentary during colder weather, so having a garden patch to tend will give you the motivation to stay active and get some exercise. However, whether your motivation is to eat better year round, keep moving those muscles, or just enjoy a favorite hobby year round, there are many benefits to investing your time and effort into a winter garden experiment.